Home » Advent , Baptism , Christmas , God's Will , Hope , Joy , love , Peace , Salvation , Second Advent , Sin Sacrifice » What Advent Truly Means! For many Advent celebrations are something they have grown up with, but for others it is something new. Today I would like to give a special overview of of the real meaning behind Advent. I hope it blesses your soul. This kingdom would begin to exist after the Babe Christ, born of a virgin, Is. 7:14, in the city of Bethlehem, Micah 5:2, would grow up into manhood and begin His work of bringing the nations of the world into the knowledge of the truth concerning all things eternal. At age 30 He began His public ministry which was blessed and confirmed by the Father at His baptism, Luke 3:21-22, a choice He made to model what we too should do as a first sign of our public engagement to follow Christ. As Jesus grew He was accepted and beloved by multitudes of people as He expounded the truths from the Old Testament in the light that God had originally intended them to be understood. Many of the leaders of the day did not appreciate how He often showed that what they taught was hypocrisy and the burdens they imposed upon the people were too much to bear; so much so that even they could not bear them themselves, Mt. 23:4; Luke 11:46. As time passed it would be this angry crowd who seize Jesus from the Garden of Gethsemane and with soldiers, swords, and torches lead Him to the High Priest to be questioned and then eventually to Pilate where He would be sentenced to be crucified. Christ came to fulfill what was written to come and to do the will of the Father. This will led Him to the cruel Cross of Calvary where He gave up His life on His own, John 19:30. The Bible tells us He did not have to do this; He could have summoned from the realms of glory 12 legions of angels to deliver His soul from death, but He did not, Mt. 26:53. Glaringly the will of the Father was completed. He, the Father, again provided a Lamb, Jesus, to be the once for all (Heb. 7:27, 9:12, 10:10) sacrifice that would take away the sin of the world. Three days after Jesus gave up His Spirit He victoriously arose from the tomb proving that acceptance of His body as our sacrifice for sin and faith in Him will also be the factors necessary for all to inherit eternal life in Heaven. Praise God and Glory to Him for the wonderful work He determinedly accomplished. 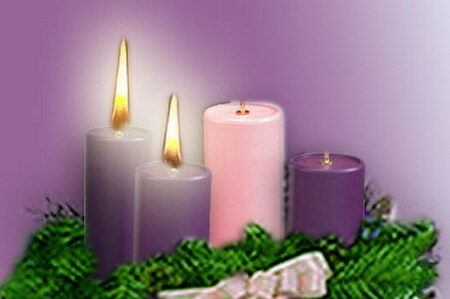 The Advent celebration uses the symbols of three purple and one pink candle with a fifth white one often seen in the center of a surrounding wreath. The candles represent what Christ imparts to all who truly believe, Hope in this life and the future Second Advent to come, Peace in our hearts and a longing for it in the world -- something that was initiated by Christ during His first Advent but will never come to full fruition until the second Advent when He returns to put away all evil and set up the Kingdom which will never end, Is 11:4-10; Rev 20:1-6. Joy is the inner satisfaction that all believers possess in knowing that Christ has forgiven them of their sin, 2 Cor. 5:21; Heb. 9:26; Rom 4:8, 5:20-21, and that He has gone to heaven to prepare a place for us, John 14:1-3, one day to return and receive us to Himself, 1 Thess. 4:13-18, 1 Cor. 15:51-57. Love is simply what took Christ to the Cross and an integral result of what is induced in the hearts of all believers toward all people of all races in all places around the globe. John tells us, "We love Him because He first loved us," 1 John 4:19. The fifth candle, a white one, often seen in the center of the wreath represents Christ as the pure Lord and Savior who was the only One ever able to remedy the sin of mankind, Heb. 4:15. Jesus, the sinless Savior, has brought us to the place where we can know for certain that through faith in Him we will have eternal life. The Advent celebration pictures not only what He imparts but who He is, the true eternal and righteous King, Lord of Lords, and Savior of the nations. This Christmas do your best to share this message of love. Our world is corrupting away and the desires of the flesh with it's openness to immorality and sin of all sorts is breaking down our society. In this world there is no true Hope, Peace, Joy, or Love for all that the world offers is a temporary counterfeit but what Christ the Lord offers is eternal.